Knee bar on rest point can be decisive for the quality of recovery before hard crux. Even you can found no hand rest. The Danaë knee pad is perfect for this case. That is to say you can climb more easily your project. We designed the Danaë knee pad specifically for rough and painful knee bars, as opposed to model Perseus, which is preserved for small crimps. Its size allows knee bars on big holds and the thickness and hardness of knee pad saves a lot of pain and bruising. We use a special rubber (Vibram) with good friction – soft enough to enable you feel the rock surface and thick enough to avoid pain. In other words you can use it almost everywhere. Above all Danaë knee pad has a shape, which is compatible with the knee bent and does not hamper its movements. We use a buckles that allow easy putting on and off even while climbing. Used buckles are one of the strongest and most durable – Duraflex. We deseigned the ribbing and Velcro to withstand the stress that have to bear. 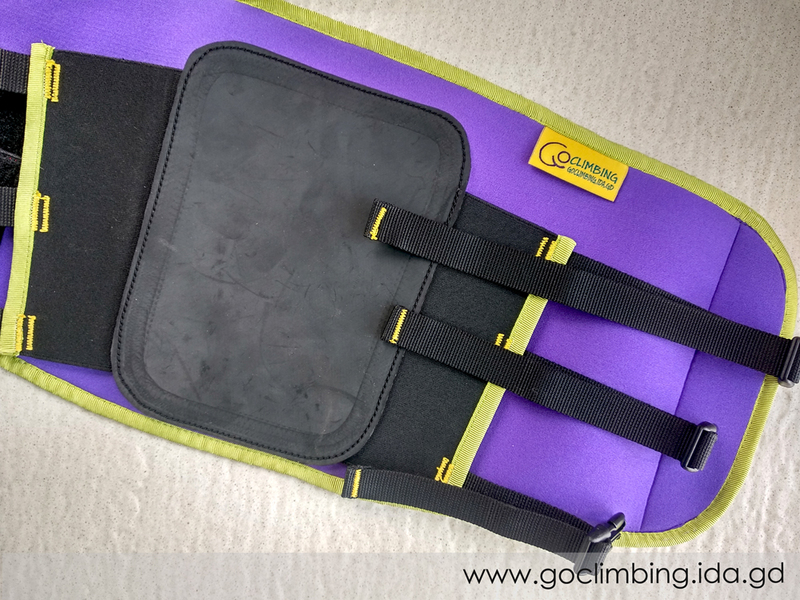 For the base of the Go Climbing knee pad we use a neopren – it’s elastic, thick fabric, which covers the foot well, without tighten it too much. We care about good fixing of the knee pad. Firstly, you can fix it with the Velcro, secondly, you tighten it with three tapes with buckles. This way you will be sure that the knee pad stay stable during climbing. On the inside of the Danaë knee pad we put a silicon dots. They prevent annoying ripping off of the knee pad. 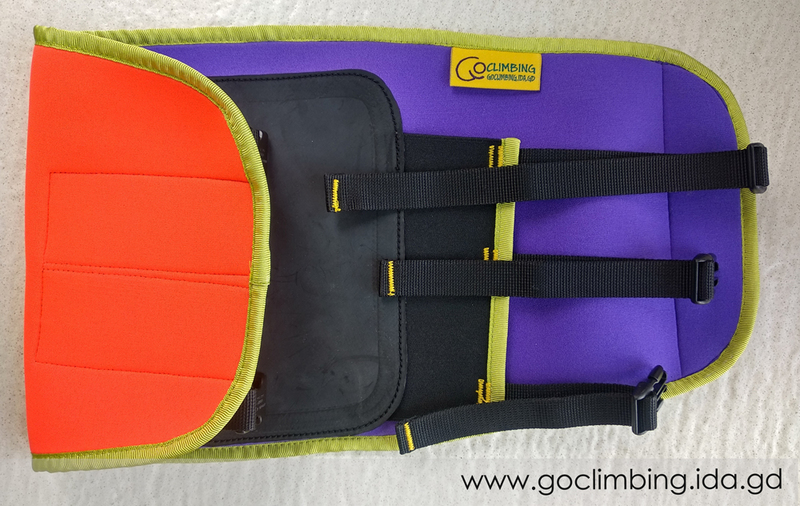 Therefore you can use it with pants, leggings or naked food – the silicon dots keep the pad on place during climbing. In conclusion, you can thrust on the knee pad all the the way to the top. Danaë knee pad have two modification – Left and Right, whose structure is pursuant with that of which leg you use the pad. Of course you can choose a neutral one – suitable for both knees. Which is your size? Scheme and table size you can see here. 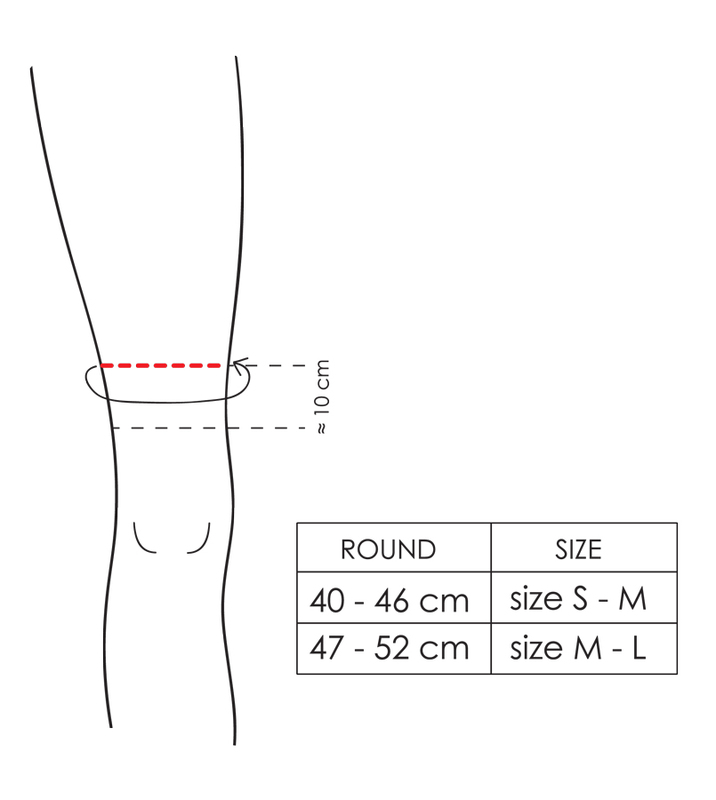 You need to measure the round of the thigh about 10 cm above the knee. The size S – M is suitable if this round is from 40 to 46 cm., and M – L – 47 to 52 cm. If you prefer a special size for you, you can order. After that you’ll be sure that it will perfectly fits you. In the pair you have Left and Right knee bar pad. i’m looking for buying two Knee bar pad Danaë model. How does it coast to ship it to France? I send you mail with details on ordering and delivery. Interested in buying the Danaë model, is it 47 euro each or for a pair? How much is shipping (Sweden)? The prices in the web are for one piece, because the customers usually looking for different models – Danaë and Perseus. I´m also interested in buying the Danaë, can you send me a mail with the details on ordering and delivery to Germany?? I am interested in buying a Danaë pad. Could you please contact me for further details? I send you an e-mail with details about delivery and ordering. I would like to buy a Danaë pad. I’ll send you an email with all details about ordering. Hi, I’m interested in your Danaë pad and was wondering how much the delivery would cost to the United States? Hi, thank you for the interest. I send you an email with information about ordering, delivery and payment. Yes, I send you the mail. Hello , im interested in buying a knee pad ,i currently live in Greece . I would like an email with full ordering process and prices please. Thank you . Hi Nikolaos, I send you an email with prices and any other information. Thank you for the intrerest. I send you all details on email. Hi Ida. Looking forward to testing the Danae size S-M. Plase contact me over e-mail for 1 piece price + shipping to Germany. Hi Stefan, thanks for the interest. I send you an email with details. Please contact me, I’m interested in buying one or two. Shipping to the Netherlands. Hello, thank you for the interest. I’ll send you an email with details for ordering and shipping. Thank you for your interest! I send you details on email. I’m interested in buying one or two, shipping in France, could you send me détails? Thank you for your ineterest. I send you details about shipping and payment on email. I’ll send you an email with all details you need! Thanks for the interest! I’d like to order two Danae- kneepads, one for the left and one for the right knee, medium size. Is shipping to Germany possible? What are the payment methods you use? The shipping to Germany is possible, takes about 10 working days and cost 9 euro. The payment is by Paypal or bank transfer. I send you an email with details. І’d lіkе tо оrdеr three Dаnае- knеераdѕ. Іѕ ѕhірріng tо Rebublic of Korea роѕѕіblе? Whаt аrе thе рауmеnt mеthоdѕ уоu uѕе? I have VISA and Mastercard. Hello Andy, yes it is possible to ship to Korea. I’ll send you more details on the email. і’m lооkіng fоr buуіng twо Кnее bаr раd Dаnаë mоdеl. Ноw dоеѕ іt соаѕt tо ѕhір іt tо Frаnсе? Thank you for the interest. You have all details on email.